The Trading Data Analysis add-in for Excel (NeuroXL) is an add-in for Excel designed to aid experts in real-world data mining and pattern recognition tasks. It hides the underlying complexity of neural network processes while providing graphs and statistics for the user easily to understand results. The Trading Data Analysis add-in for Excel uses only proven algorithms and techniques, and integrates seamlessly with Microsoft Excel. Neural networks are a proven, widely used technology to solve complex classification problems. Loosely modeled after the human brain, neural networks are interconnected networks of independent processors that, by changing their connections (known as training), learn the solution to a problem. 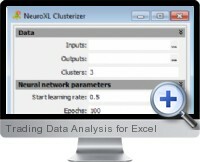 Trading Data Analysis for Excel implements self-organizing neural networks, which perform categorization by learning the trends and relationships of clusters within your data. The Trading Data Analysis add-in's ability to handle numerous, often-interrelated variables makes it widely applicable to classifying market data. For example, a trader may wish to classify stocks as buy, hold, or sell based on historical data. No prior knowledge of neural networks required. Provides proven neural network technology for highly accurate classification. Detects relationships and trends in data that traditional methods overlook. Lowest cost neural network classification product on the market. Compatible with all Microsoft Excel-based trading software.